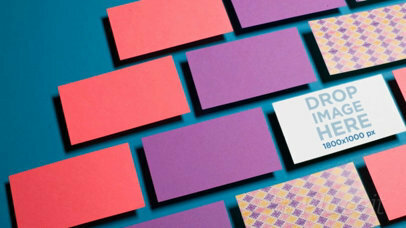 Read more about our Business Card Mockups! 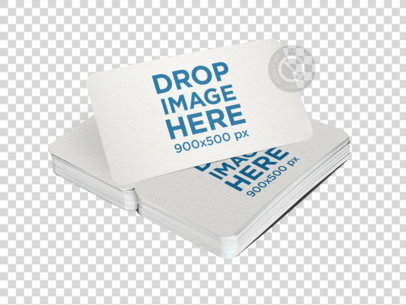 In this image, there are three business cards placed onto a solid background. The topmost business card is tilted slightly to the left. The middle business card is tilted slightly to the right and is covering up a small part of the top card. The lowest business card is tilted to the left very slightly, but not as much as the top card. 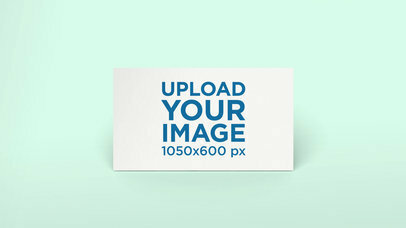 Use this minimalistic business card mockup to promote your branding designs! 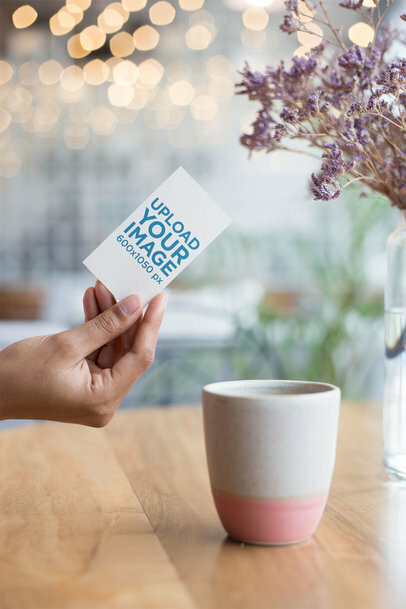 Our business card mockups are fully customizable, try as many branding designs as you want and get more customers right away. Improving your marketing visuals is a great way to make your brand look more professional! 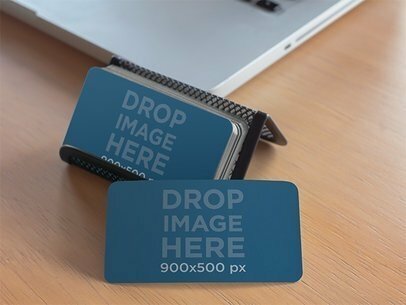 Promote your designs on an actual business card and let people know what you're about. Our mockups are super easy to use and customizable. You can change the business card and background color and even make it transparent. Cool, right? Try it out, see how your designs will look. 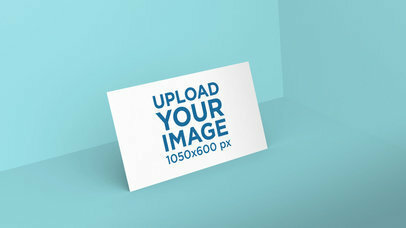 Promote your amazing Business Cards with Placeit's easy to use mockups. Our mockups offer the fastest graphics, best models, renders, and more. You can even change the background! Try it out now. 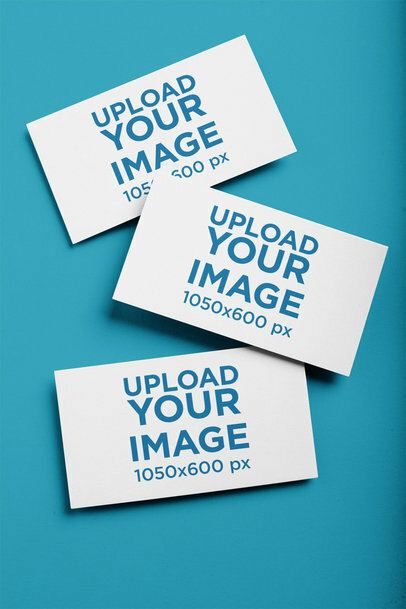 Edit your business card mockup and see your sales grow. 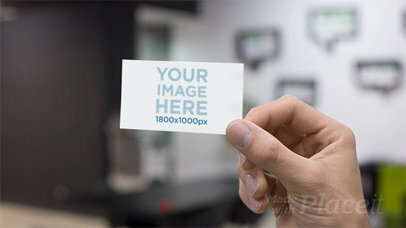 A hand holds up a blank business card with the thumb on the front of the business card and fingers on the back. The hand is the left hand. The hand is Caucasian with no nail polish. There are about one hundred out of focus small white lights in the background above the hand and the business card. The rest of background is blurry and mostly white. 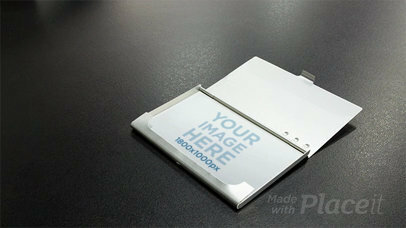 The image displays a couple of white envelopes. They are both tilted to the left. They are casting a black shadow on the ground, and they are laying on a solid surface. The photo features a pile of four business cards. The top right pile is tilted left. The top left pile is tilted left and downwards. The bottom left pile is tilted left pointed up. The bottom right pile is tilted left and slightly downwards. The image features a stack of business cards. One of the business cards is upright to the left of the envelopes but still on top of the other business cards. The stack of business cards is tilted to the left. A young woman is staring happily. She is shown smiling and eager to show off what is in her hands. The woman is sporting long, brown curly hair that is pushed behind her. She is wearing a vibrant shirt. She is African American and is holding a card up with the tip of her fingers. A female hand is holding a card inside a building. The ceiling has multiple lamps. The lights are turned on. There is a contrast between the hanks holding the business card and the background. The center of the photo is a woman holding a business card. The only portion of the lady that is visible is her arm. Her arm is resting on a table that appears to be in a cafe or coffee shop. A coffee cup and saucer are placed on the table directly above her hand, and a vase with flowers is to the right. The center of the image contains two separate stacks of business cards. The stack to the left is thicker than the stack to the right. They are positioned vertically rather than horizontally. The cards are leaning against a solid wall and resting on a solid surface, the colors of both of these can be modified. 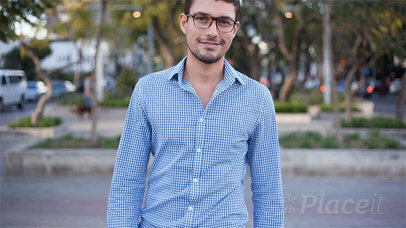 The image is positioned at an angle so that the break between colors cuts diagonally through the bottom part of the image. A young female is standing indoors with a panel of square glasses directly behind her. She wears a pink t-shirt with a crew neck collar and has a smile on her face. She is a black girl with voluminous and curly black hair and dark eyes and eyebrows. She holds a business card in front of her face with her right hand and it covers her right eye. She is in her teenage years. 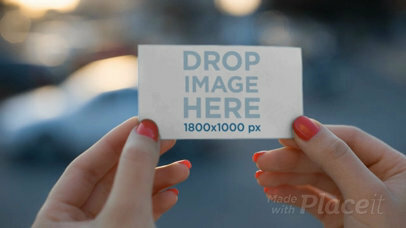 The index finger and thumb of a hand hold a business card over a smooth wooden table. A ceramic white coffee mug with a pink base sits nearby. The table also has a glass vase filled three quarters with water and delicate, small purple flowers that may be beginning to wilt. The background is blurred but looks to have some green plant life. There are also blurred, dotted lights at the top. A feminine, brown-skinned, and slender hand is outstretched near the edge of a round, powder-blue table with a wave embossed on it. The hand is holding a business card along its edges while presumably contemplating related matters. The backdrop is bright, sunny, and looks like it's early morning. There is a small potted plant located behind the wave design on the table. 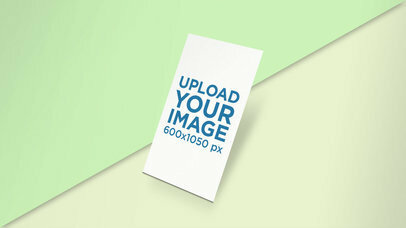 This business card mockup template will become a stunning piece of advertising once it displays your design! 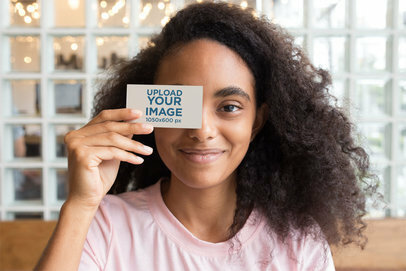 All you need to do is drop your image straight onto the business card mockup and Placeit will adjust it to create a compelling piece of branding, it will even adjust the background color to select a shade that will match the colors on your own design! 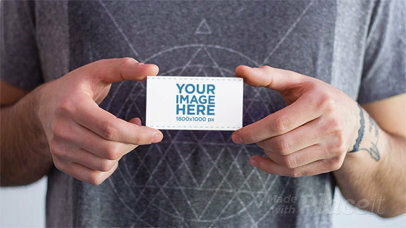 Try using this special effects business card mockup right away and see the magic yourself! 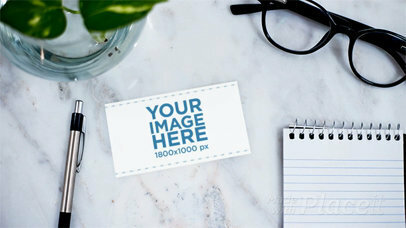 Check out this awesome mockup of a business man using a business card to contact a person! All you have to do is drag n' drop a jpeg or png file on the interface, it'll be processed automatically. That's right, after a few seconds you'll see your design on his business card. Amazing, right? Start using Placeit and make your revenue grow! 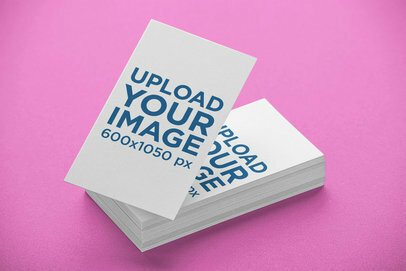 Try another Business Card Mockup here! 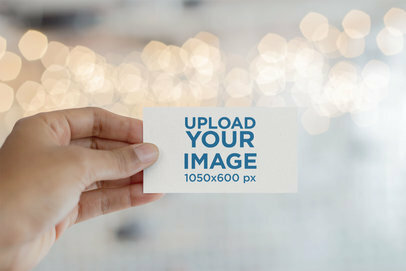 Have a look at this awesome template of a business card floating on a transparent background, it's a really essential visual asset that you'll need if you are looking for a versatile way to showcase your latest design to your audience. Drag-and-drop a jpeg or png file on the interface, we will merge it for you in just seconds. 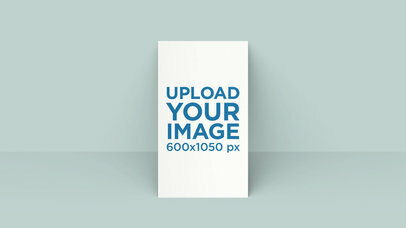 Try another Business Card Mockup here! 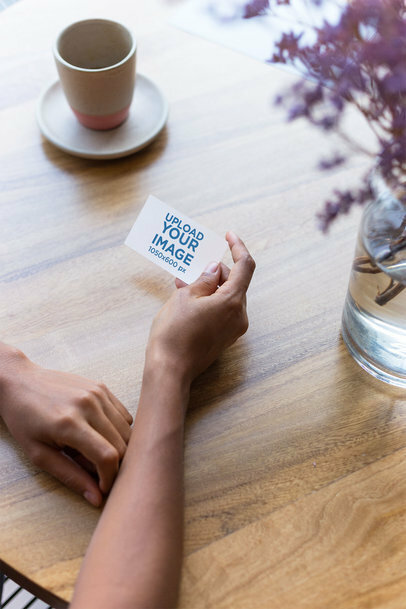 Have a look at this awesome mockup of two stacks of business cards with rounded corners lying on a transparent surface, it's a really cool image that you can use to make your income grow! 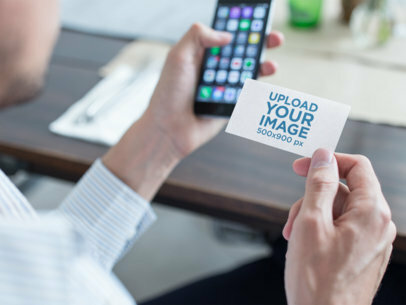 Start now using Placeit and have a better image marketing! 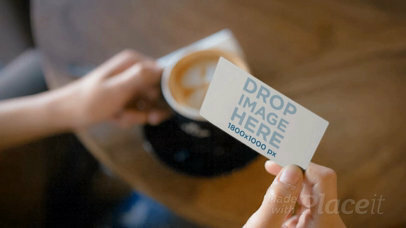 Try another Business Card Mockup here! Please note that colors will be removed from your design to best match the embossed card. 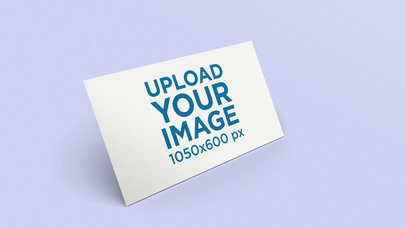 This business card mockup is a great way for you to showcase your brand in a clever way that will include a scenario to which your consumer demographic will be able to relate. In this case, we can see the business card set up on a card holder over a wooden desk in what seems to be a creative office. 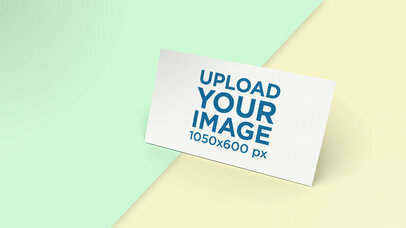 Use this business card mockup for your branding campaign right away. This business card is lying on a photographer's wooden white table while some things are moving around it. You can see some leaves of a plant that's there, some photos, a camera, and accessories for the camera. 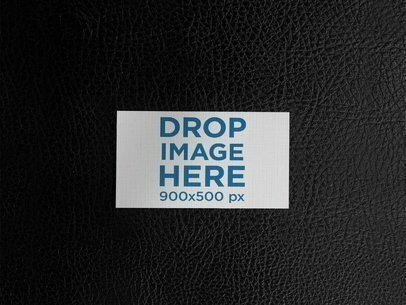 All you need to do to merge your design with this mockup stop motion is drag-and-drop your image design! We'll only take a few seconds to merge it for you. Try another Business Card Mockup! This stop-motion mockup of a business card moving on a wooden desk while a pen, a laptop, and a notepad are nearby is an awesome choice if you want to showcase your brand in a trendy manner! All you have to do is drag-and-drop your image design on the interface, we will merge it for you in only seconds! Try another Business Card Mockup! 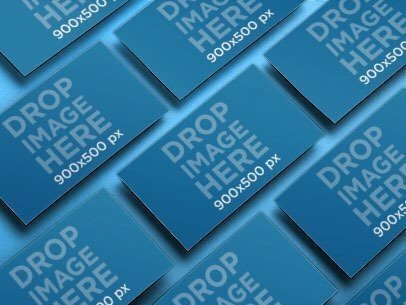 For best results, we recommend uploading an image that is 1800x1000 px. The file must be smaller than 5MB and not exceed 5000 px on either height or width. 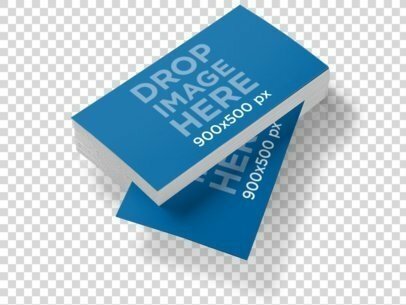 Try now this awesome stop motion mockup of a business card lying over a green surface, while other business cards around it dissapear! All you need to do to merge your design with it is drag and drop your image file, we will merge it for you in just seconds! 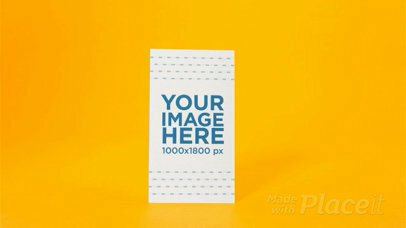 Try another Business Card Mockup here! Check out this awesome stop motion mockup of a business card lying on a granite desk while a pen, a plant, a notepad, and glasses are moving beside it. It's a great option for you to showcase your latest brand in a professional and at the same time, trendy manner. 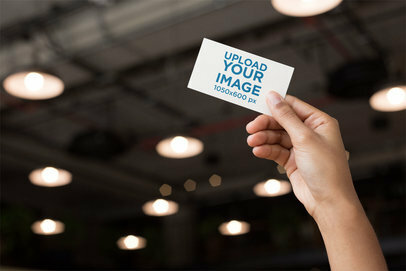 If you drop your image on our interface, we will merge it with the business card in just seconds! All you will have to do is wait a few seconds. Awesome, right? 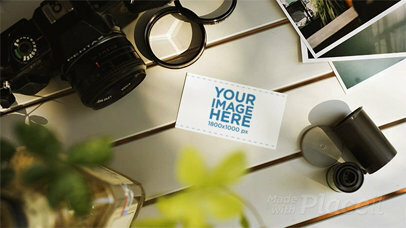 Try another Business Card Mockup! Check out this awesome stop motion mockup! 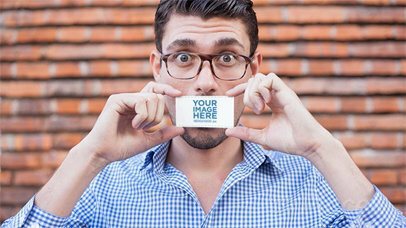 Featuring a young dude being funny while holding a business card on the street, it's an awesome choice for you to promote your brand in an even more creative way! All you have to do is drag-n-drop your image logo on the interface, we will have it merged for you in only seconds! Great, right? 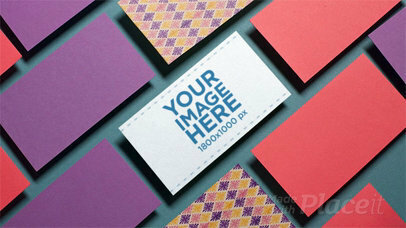 Try another Business Card Mockup! 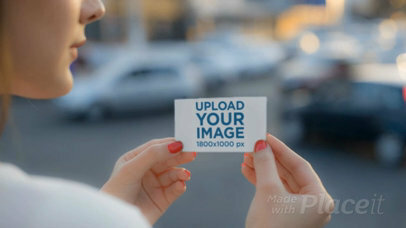 Check out now this awesome stop-motion mockup of a guy holding a business card that magically disappears! 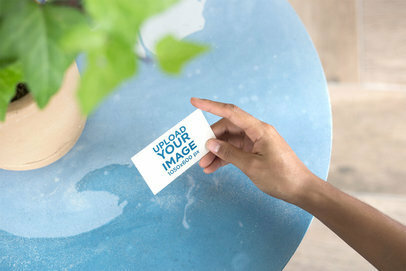 It's a really cool mockup stop motion if you want to showcase your design in a really creative way! 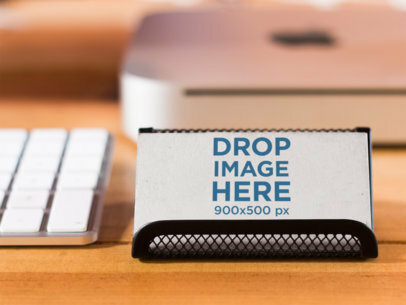 Drag-n-drop the image file in the interface, we will have it ready for you in just seconds! 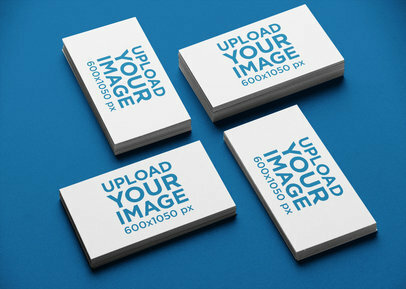 Try another Business Card Mockup! 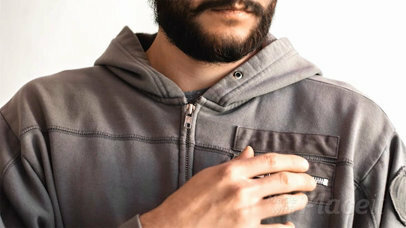 Check out this awesomely made stop-motion mockup of a man using a black t-shirt making appear a business card magically! It's great to showcase your latest design in a really creative way. 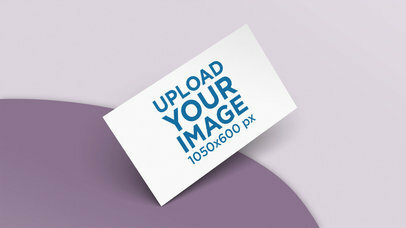 All you need to do is drag-and-drop your image design on the interface, we will process it for you in just seconds! Try another Business Card Mockup! Were you looking for a creative way to show your customers your brand new design? 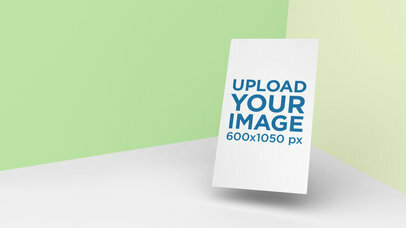 Drag and drop your image file on the interface, we will merge it for you in just seconds with this mockup! It's awesome since it's a stop motion of a young hipster man that takes a business card out of his pocket and shows it to the person watching this video! Start now! Try another Business Card Mockup! Check out this awesome stop motion mockup of a guy talking with his phone and looking at a business card that he takes out of his denim jacket! And all of this while he's chilling in his living room. Awesome, right? 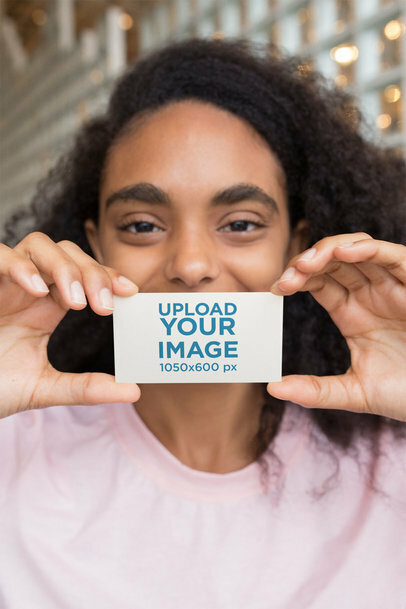 All you have to do is drag and drop your image design on the interface and we will have it processed for you in just seconds! 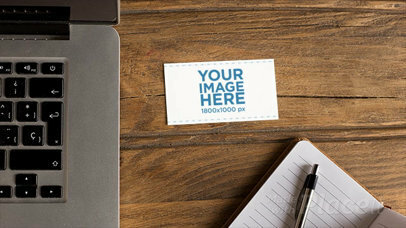 Try another Business Card Mockup! 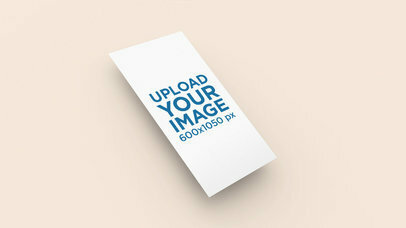 Check out this awesome mockup of a business card lying on a leather surface, it's lying there horizontally. Use this image and make your revenue grow! All you have to do is drag n' drop an image file on the interface, we will merge it for you in just seconds. Start using Placeit and make your revenue grow! 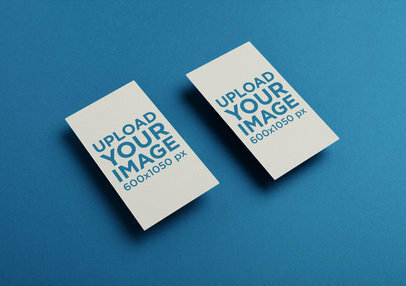 Try another Business Card Mockup here! Were you looking for a creative way to showcase your new brand? Is your image branding just not enough? 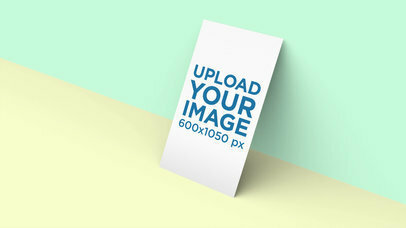 Just use this Placeit Stop Motion Mockup now and boost your sales! 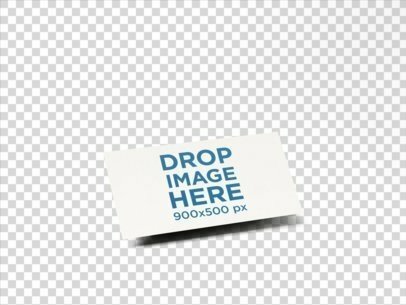 This one is a close up of a business card being held by a hand at an office, is there a better way to show your newest brand? Do it now, all you have to do is drag and drop your image design on the interface, we will merge it for you in just seconds! 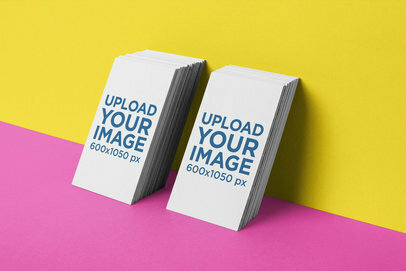 Try another Business Card Mockup!